Unfortunately for you waterfowl hunters, the duck and goose season is coming to an end…luckily a lot of you also compete in Hunt Tests! If you are new to Hunt Tests and training for them here is some gear I would suggest that you get as soon as possible. Crate: You may already have a crate. 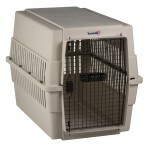 If not you can often get one on Craigslist or I have found good prices at www.DOG.com. Make sure to use your crate when you go out to train! There is nothing more embarrassing then your dog jumping out of the truck and running after a bird that is not his to get! It is also very disruptive to your training group and you might not get asked back. Bumpers: I suggest that you have at least 6-12 bumpers. If your dog is at the Junior Hunter level you probably only need white ones but as you progress in their training you will also want a few orange ones. My favorite bumpers are Lucky Dog, but they are not the cheapest! 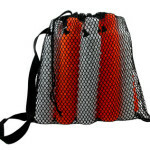 Here are a few website to visit to shop around. Heeling Stick: A heeling stick is a GREAT tool that can be used for everything from heeling to the line to steadying your dog. 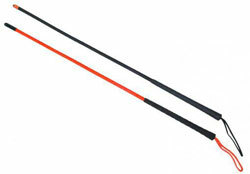 Visit the above websites to shop for heeling sticks. Collar: I am not going to recommend a specific collar for you because it depends on your dog and how far you think you will go in your training. 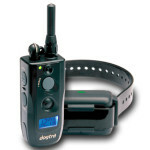 However I do strongly suggest getting one of the the two main brands, either Dogtra or Tri Tronics. There are other brands, but as of yet I have not seen one as good as what Dogtra and Tri Tronics make. When shopping for your collar make sure the remote and charger are both waterproof, pay attention to the distance that the collar will work at, and what kind of battery. Leash: I am sure you already have one of these. USE IT! Even if your dog comes when they are called make sure you have your leash handy and use it when walking to the line. Training Group: FIND YOURSELF A TRAINING GROUP…whether you go to a picnic trial or training day with one of the following clubs Oregon Hunting Retriever Club, Lower Columbia River HRC or another club find yourself a training group. When you are at a picnic trial introduce yourself to people. Maybe you can form your own training group. Or call around to the pros in the area and see if you can join one of their groups…feel free to call or email me adrienne@rogueretrievers.com or 503 522 9896. 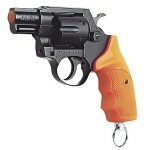 Popper Gun: You can probably get away with not having one of these but if you have one it will definitely get used! I have an Alfa Starter Pistol it’s older and has been working well for years but shop around at the above websites. You get what you pay for when it comes to these! 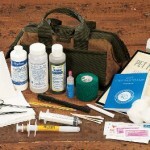 First Aid Kit: You should have a First Aid Kit with you anytime you are out in the field training your dog…hopefully you will not have to use it but it is always best to be prepared! Cabelas’ sells a very nice “kit” with everything you will need. Or you can make your own. 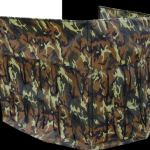 Visit one of my pervious blogs Getting Ready for Hunting Season, to find out what you need to make your own kit. This entry was posted in Personals by RRadmin. Bookmark the permalink.